This is review No. 7 of 16 in the first round of our competition. Each review will compare four burritos, with my favorite advancing to Round 2. This week, in the third of four reviews from our West region, I visit the deserts of Arizona and Nevada to eat some classic burritos and a petite object wrapped in dough. The use of “barrio” instead of “neighborhood” is a distinction reserved for historically Hispanic neighborhoods in Tucson. According to the city’s Downtown Partnership, Barrio Hollywood is one of the oldest neighborhoods, famous for its family-run restaurants, of which St. Mary’s Mexican Food is one. On a recent and suffocatingly hot day, St. Mary’s blasted the air conditioning over the eight tables in the small dining area of the humble cinderblock building. When I arrived, I put on my sweatshirt and got in line next to the bright-orange and green walls to place my order. 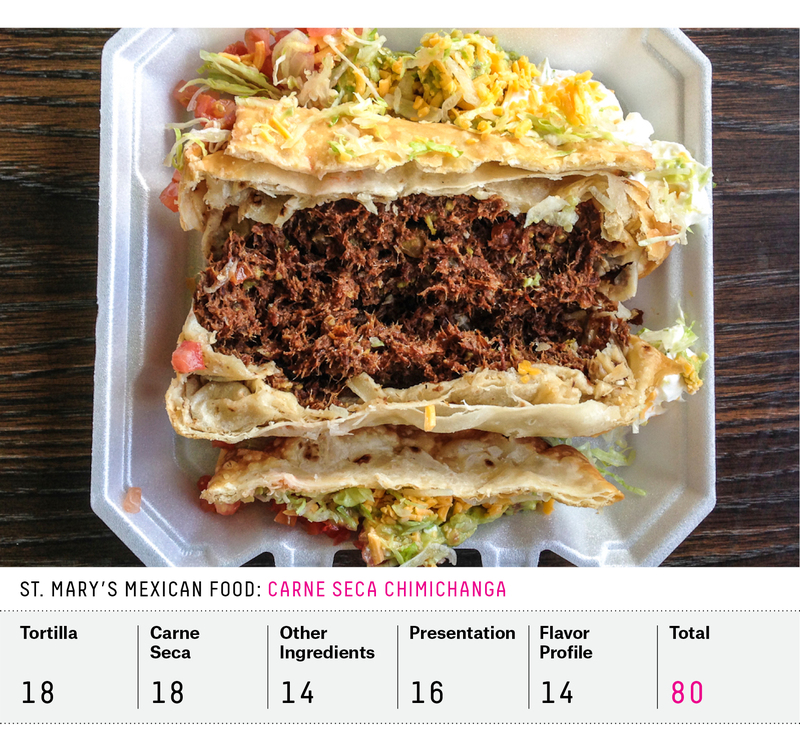 St. Mary’s Mexican Food doesn’t serve burritos, just burros. Though the naming idiosyncrasy is a regionalism, it’s a distinction that I wish more burrito-selling establishments could make. Adding “ito” to the end of a word in Spanish is diminutive; it would be nice to know in advance whether the burrito I’m about to consume makes for a respectable lunch or will put me down for the count. But the nomenclature system is neither the most impressive nor distinctive thing about St. Mary’s. 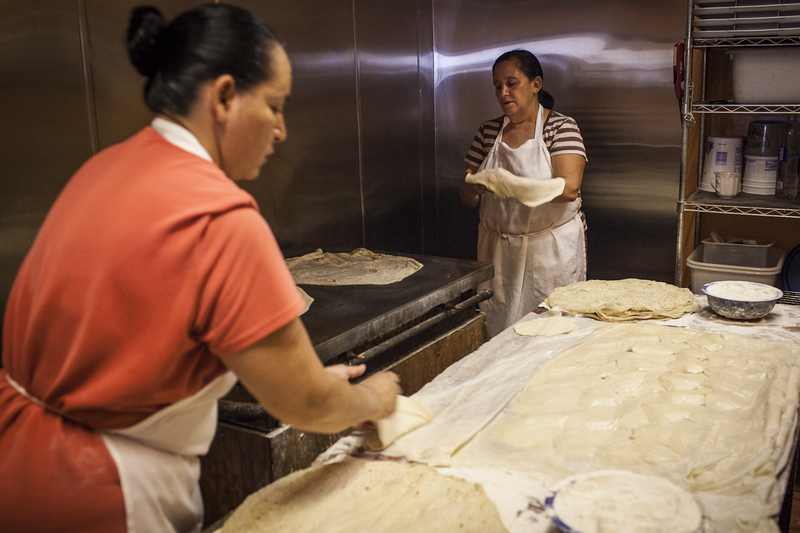 The real claim to fame is that it turns out some of the nation’s best tortillas, each and every step done by hand in a cramped kitchen at the back of the restaurant. St. Mary’s is open from 8 a.m. to 6:30 p.m., but the tortillas are made in the first half of the day, making it a perfect stop for lunch. While the homemade tortillas are perhaps the main draw, the restaurant is also known for its carne seca, especially when it comes in a chimichanga. The chimis, as St. Mary’s call them, are made with tortillas from another local tortilleria, because the fresh hand pulled versions don’t hold up well to the massive servings of meat inside, especially when fried. I tried the burritos, one with egg and chorizo, another with carne seca, and while the homemade tortillas were my favorite of all the ingredients, the carne seca chimi is where St. Mary’s excels. The tortilla was fried until it bubbled to the color of desert sands on the outside, while staying supple on the inner layers. It was crunchy, but disintegrated as I bit into it, flaking off and melting in my mouth. On the bottom, the crunch succumbed to the few juices of the massive mound of carne seca, the single ingredient inside. Piled high on top were the rest of the fixings: guacamole, shredded cheddar, sour cream, lettuce, onion and tomato. What separated the guacamole from supermarket pre-mixed guac were chunks of fresh, salty, Mexican farmers cheese. The rest of the toppings were unremarkable, but necessary to balance the salty, dry pieces of carne seca. The wild combination of textures was excellent, but I had to dock the chimi points in presentation for the packaging: this is a knife and fork operation, but it comes in a styrofoam container (regardless of whether it’s to stay or to go) that hugs the massive chimichanga tightly, making it difficult to cut. In the flight path of the Phoenix airport, in a whitewashed cinderblock building, a dozen women dance like worker bees, fluttering between a counter piled with dough and hot stovetops. As they move between the two, they toss, stretch and pull the balls of floury masa into massive thin disks. Then they place them on the hot stovetop to cook, brown, and bubble before they are served to what seems like an infinite clientele. On a recent Saturday, I went to try the red machaca burritos. Machaca and carne seca are synonymous, and Phoenix is known for the spectrum of moisture available in its machaca. Carolina’s Mexican Food serves its machaca in an abundance of sauce, and it is decadently juicy. 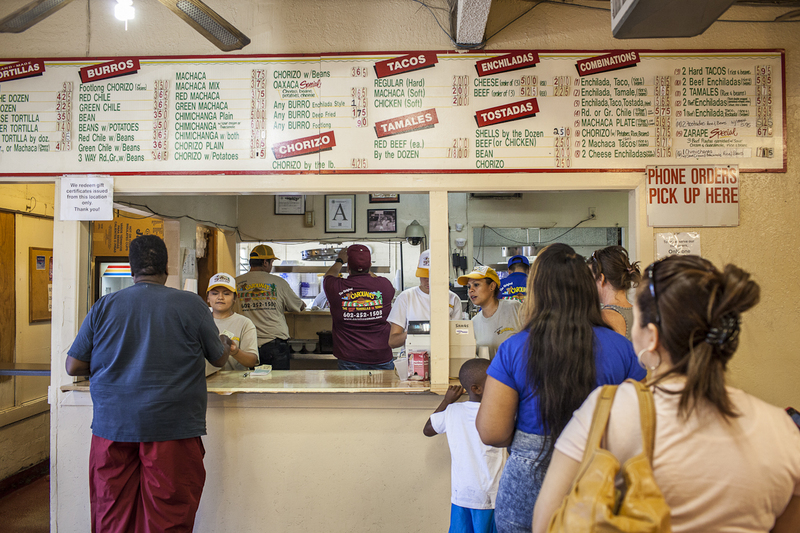 The workers at Carolina’s wear beige T-shirts and yellow trucker hats as they take orders, make tortillas, prepare meals and clean up after the steady stream of patrons; this place is definitely not a secret for Phoenix residents (and as the No. 2 seed in our West region, we knew it would be a top contender in our competition). There’s nothing fancy about Carolina’s on Mohave Street (there are two additional locations). Yellow paint peels from the walls, the floors, once covered in red, have mostly worn away to plain cement. Exposed pipes run across the ceiling, and orange swivel chairs bolted to the floor are reminiscent of ’80’s McDonald’s seating. Seated at a booth in the corner, I picked up my wax-paper-wrapped burrito from its paper plate. An injection of juice erupted into my mouth on the first bite. The machaca is awesome — tangy with a little heat, creamy and fatty, but not heavy. The shredded meat combined with an abundance of liquid and gooey cheese makes it a delight to eat, and also an engineering feat: How thin can the tortilla be without falling apart? How much water and how much lard will make it flaky and moist, not rubbery, but still hold it together? Carolina’s has mastered the balance — just the right amount of water to make it pliable and stretchy to impossibly thin proportions, but it holds together until the end, keeping the juices inside the tortilla and off the plate. The red machaca (they also sell green) is the winner at Carolina’s, partly because it’s still blessed with pieces of green chili. It’s the best of both worlds, meaty texture of the green chiles with the heat, bite, and earthiness of the red. Vincent’s on Camelback is one of the few survivors of a New Southwestern cooking craze that took the country (particularly the western half) by storm in the 1990s, when haute cooking and traditional French techniques were applied to Southwestern flavors. It’s an unassuming little building on Phoenix’s fancy Camelback Road (named after a mountain that provides the city’s northern border, and looks like its namesake), oddly nestled between a gas station and a drab office building, and hidden behind enough bushes that I drove by it twice before I found it. I was there to eat the lobster chimichanga appetizer, by far the most expensive burrito in the bracket. For its $18.50 price tag, I could buy 18 1/2 burritos in Ciudad Juarez, Mexico. That’s a lot to live up to. I made a reservation for a Friday evening. I was seated and presented with a menu, but there was no chimichanga to be found. I remarked to the waiter that a friend had recommended the chimichanga. “The word has gotten out!” he replied, and then explained that while it’s no longer a menu staple, he was pretty certain the chef could whip one up. Several minutes later, he came back with a long face, and I knew he had no good news. All of the lobster had been sent out for catering, there could be no chimichanga. There was no way to be discreet about this burrito and still try it. “What about tomorrow? If I came back tomorrow could the chef make the chimichanga?” The waiter smirked at my insistence, but went away again, returning with good news. The following day, after lunch at Carolina’s, I was back at Vincent’s, this time sitting at the bar. The wait staff gave me the hello of a regular, well aware that I was there for one thing, and one thing alone. I kept reminding myself that my mandate is different from that of a traditional food reviewer and that they couldn’t possibly know who I was. But I was so flustered by the awkwardness of the situation that I realized the next day I forgot to take photos, and I definitely didn’t whip out my scalpel to do a dissection. The “chimichanga” arrived: filo dough wrapped around lobster and leeks in a beurre blanc sauce. A side of guacamole and salad also graced the plate. The beurre blanc sprang to life with the addition of basil and tomato. The guacamole was tended to with care, making it all the more obvious there is no fixing a lackluster avocado. The lobster, goat cheese and leeks were a delightful trio, tangy and rich. While tasty, filo dough is not a tortilla, and therefore, after much consideration, was disqualified from receiving a score. The total for a chimichanga appetizer and a glass of wine? $36. St. Mary’s and Carolina’s were voted into the Burrito Bracket based on years of reputation and tradition. 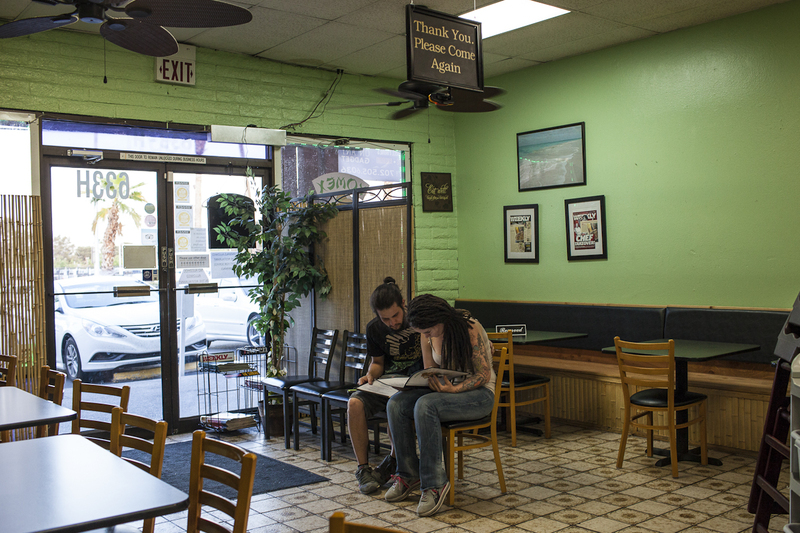 Vincent’s is the lone fine-dining burrito, an oddity, but our Burrito Selection Committee had firsthand knowledge to back it up. KoMex’s entry in the bracket, however, was 100 percent a result of Yelp, whose reviews factored into our deliberations when we chose the 64 restaurants in the competition. 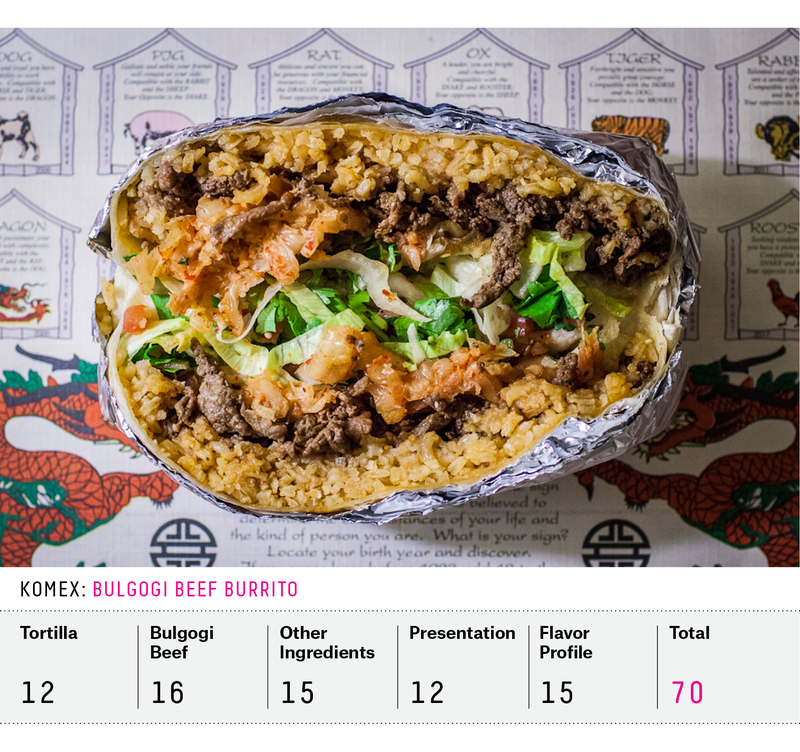 It has the highest Value Over Replacement Burrito (VORB) score in the West, and the second highest in the country, but we could find no one who’d actually eaten there. KoMex is located miles from The Strip, in an unassuming sprawl of low-slung buildings. With a cell phone repair shop on one side and an envio de dinero on the other, I kept asking myself, how did this become a Yelp sensation? According to its website, the family owned a meat market, and at lunchtime they prepared Korean-Mexican hybrid meals for themselves. Regulars started to take notice, posted about it on Yelp, and its popularity exploded. The inside is spartan — mint green walls, wooden benches, seats for 30 to 40 people. I had high hopes for KoMex, and the meal started with great promise. When we sat down, a basket of freshly made chips came out, with ramekins of fresh salsa and guacamole. Next to it sat a tray of sauces in clear, round plastic containers, salsas that represented a study in the genealogy of spice, linking sweet chili and vinegary heat from opposite sides of the globe. It was unpretentious fusion, down to the paper Chinese horoscope placemats. I ordered a bulgogi beef burrito, which came with Mexican rice, green and brown onions, pico de gallo, cilantro, lettuce, sesame seeds and kimchi inside. The bulgogi was surprisingly potent, heavy on the sweet, but brought back around by the other salty ingredients. The fresh green onions pull it back toward Korea from the spices of the “Mexican” rice. The tortilla was far too big for the ingredients; I had to pull big wads away to get to the good stuff. This was a case where wrapping everything in a tortilla did more harm than good. 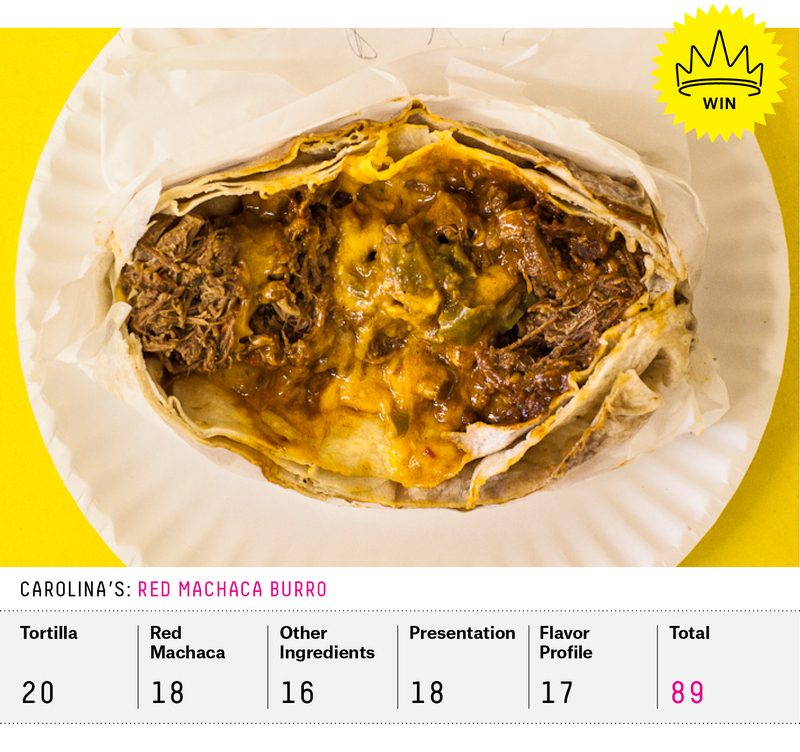 The juicy red machaca at Carolina’s gets the win.